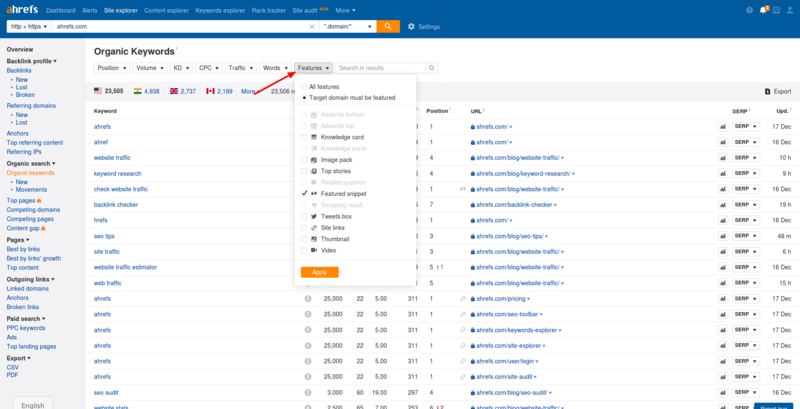 To check whether your website owns any kind of SERP features, you can use Ahrefs Site Explorer and its "Organic keywords" report. In this report, just click the "Features" filter and you’ll see a drop down menu with all kinds of SERP features available at this moment. Choose the “Target domain must be featured” option and check the features you want to apply. Let’s say you need the “Featured snippet” option. Choose it from the menu and our system will show you all the keywords you’re currently ranking for in featured snippets of search results.